New business models and competition, extensive use of technology, and changing tenant and investor expectations are redefining the commercial real estate (CRE) industry. In our 2018 Real Estate Outlook, we emphasized that RE companies will likely have to take some risks and embrace change to adapt for the future.1 Since then, we’ve seen these factors occurring at ever-increasing rates, which has continuously challenged companies to deal effectively with the relentless pace of change. As a result, traditional rules of the road might not work fast enough to provide the agility CRE companies of the future will likely require. Many surveyed investors expect to prioritize their investments in existing and potential investee companies that respond rapidly to changes in business models and adopt a variety of technologies to make buildings future ready. Survey respondents see a significant impact from technology advancements on legacy properties in fewer than three years. With investors seemingly committed to investing in newer business models and a tech-enabled ecosystem, how can CRE companies cash in on the gold rush? Fundamentally, CRE companies should gain a thorough understanding of the changing usage pattern of the built space. Take the example of WeWork, the co-sharing space owner that is positioning itself as a “services” company rather than a property owner-operator. Since its inception in 2010, the company has grown from a single space in New York City to 287 physical locations across 77 cities and 23 countries globally, as of August 2018.2 At $20 billion, WeWork is considered among the most valued tech startups, following Uber and Airbnb.3 The company’s growth outstrips many traditional CRE companies. What are the companies with new business models doing differently? These companies, which can be considered change agents, are typically retaining the core ethos of the real estate business—the importance of location—while changing the mind-set about how the physical space is consumed. Powered by technology, their value proposition lies in augmenting the user experience. For instance, WeWork’s goal appears to be to create not only a functional experience but also a memorable one through a vibrant ambience, varied open-seating options, amenities, and networking opportunities for the on-the-go Millennial and Gen Z workforce. Change agents like WeWork are repositioning the CRE asset as not just a physical space but a service hub. In addition, they strive to differentiate themselves with a nimble and flexible business model. Once CRE companies are ready to change their mind-set, agility tends to be the most important factor that can enable them to rethink the way they approach change, remain competitive, and grow. 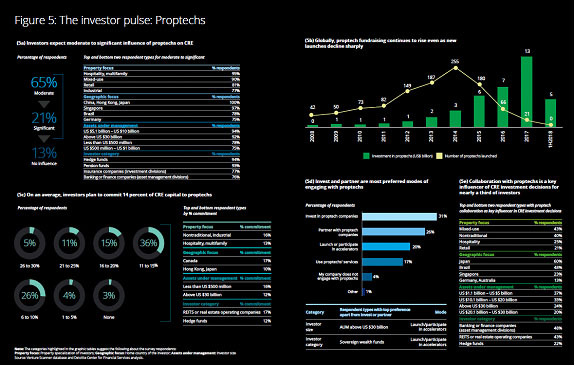 Given the increasing uncertainty in the CRE sector, this year’s outlook takes stock of the current business environment and uncovers key investor preferences on capital allocations, use of technology, cyber risk management, talent, and the role of proptechs. We also provide actionable recommendations for how an agile CRE company can respond to these key investor preferences. Global CRE investments continue to rise on the back of steady economic and employment growth in key global markets. This is despite some concerns about a flattening yield curve, various country tax reform initiatives, and the threat of trade tariffs as well as the yet to be fully determined impact of Brexit in Europe.4 In the first half of 2018, global CRE transaction volume increased 13 percent year over year (YOY) to $341 billion.5 The Americas’ volume rose by 9 percent YOY to $132 billion.6 The United States led the Americas’ growth with a volume of $122 billion (+11 percent YOY). The trend is expected to continue, as 97 percent of our survey respondents plan to increase their capital commitment to CRE over the next 18 months (see figure 1). Respondents from the United States plan to increase their capital commitments by 13 percent in this time frame, while those in Germany (13 percent) and Canada (12 percent) show similar levels of interest. In terms of inbound capital, the United States is the most preferred CRE market globally, followed by Hong Kong and China. Surveyed executives plan to diversify their portfolios through higher investments in newer and emerging business models and thematic investments. Over half of the survey sample aims to invest or increase investments in properties with flexible leases, and 44 percent plan to do so for flexible spaces. Investors seem to realize that their investments should be tied to the changing nature of work and tenant preferences. As such, the new capital commitment is unlikely to flow entirely into traditional CRE. For instance, survey respondents specializing in mixeduse and nontraditional properties plan to increase their capital commitment by a higher percentage than those focused on traditional properties (see figure 1c). Specifically, under nontraditional properties, those surveyed are likely to increase investments in data centers and health care (including senior housing) facilities. While investors diversify their risks, they are expected to continue to value traditional properties and longer-term and high-credit-worthy tenants. 97 percent of our survey respondents plan to increase their capital commitment to CRE over the next 18 months. Respondents from the United States plan to increase their capital commitments by 13 percent in this time frame, while those in Germany (13 percent) and Canada (12 percent) show similar levels of interest. Investors’ capital commitment plans suggest CRE companies could have an advantage if they stay close to and demonstrate clarity on their core investment strategies, and risk alignment against those strategies, while balancing and diversifying their property portfolios. However, even the meaning of “diversification” could be challenged. Properties and portfolios could take different shapes and forms, such as building more flexible spaces and making properties more experiential and engaging. Most traditional property real estate investment trusts, except industrials and certain classes of non-traditional REITs, are trading at a discount to their net asset values. Accordingly, CRE companies may also be able to take advantage of mergers & acquisitions (M&A) and joint venture or partnering routes. Companies can leverage data-driven analysis to craft a more robust strategy around current market positions and analyze how expansion into newer properties could complement their existing ones. Strategy linkage driven by supporting data can help demonstrate how a single investment not only presents operational synergies but also evolves the broader portfolio. For instance, retail owners could conduct highest and best use analysis based on location, surrounding demographics, and other macro factors to repurpose some of their vacant assets into non-traditional uses such as data centers and senior housing and create new sources of revenue. CRE companies should re-imagine tenant experience by weaving technology throughout the tenant life cycle. This can help strengthen tenant stickiness and therefore valuations. For instance, CRE owners and developers can use a combination of augmented (AR) and virtual (VR) reality, commonly known as mixed reality, to allow potential buyers or tenants to visualize the new property using a 360-degree immersive experience and offer multiple finished site options. This may also expand the reach to potential clients across different geographies. Companies could also leverage technologies such as Internet of Things (IoT), artificial intelligence (AI), and predictive analytics to (re)develop and tailor existing or new buildings to suit changing tenant preferences and to anticipate tenant needs. This also provides an opportunity for CRE companies to partner with tenants to augment the end-user experience. Companies should reconsider their existing tenant mix, as physical spaces that offer diverse experiences are providing an opportunity to yield higher occupancy and rents. CRE companies should consider using traditional and alternative data, AI, and predictive analytics for smarter tenant repositioning by having a more diverse tenant portfolio. For example, some retail owners are now offering empty mall space to retail incubators or even co-sharing work spaces.9 These new arrangements seem beneficial to most stakeholders, even though these new forms of tenants occupy a relatively smaller portion of the leasable space. Retail incubators get a marketplace to demo their products before they expand their physical presence, and people working in co-working spaces get more networking opportunities and increased “walkability” for their eating, shopping, and entertainment needs.10 And of course, for retail owners, all this generally means a higher-value experience for the entire property due to an attractive tenant mix and increased retention of existing tenants through higher foot traffic. Companies can add other leading models, such as enhancing existing lease administration processes, to better offer short-term leases or a hybrid along with longer-term leases. With increased business uncertainty, traditional tenants are looking at more flexible leases, while the newer form of tenants thrive on such lease models.11 Landlords, for their part, can see a direct benefit on their net operating income by leasing out vacant spaces. Moving from longerterm to short-term leases may require a change in financial forecasting techniques, as it would impact revenue stream predictability. By revamping the user experience, tenant mix, and lease administration processes, companies can not only reduce tenant risk but also create a differentiating brand. Real estate has arrived as a meaningful and strategic long-term play for many investors. With increased investor interest in CRE, REITs can expand and diversify their investor pool. They can take advantage of the separate Global Industry Classification Standard (GICS) of real estate and help generalist investors to better understand the nuances of REIT operations, performance, and valuation. Companies can frame a targeted expansion strategy for generalist investors—such as pension, endowment, and foundation funds—who have traditionally under-allocated to REITs but are warming up to REIT investments.12 For instance, on average, pension fund respondents to the Deloitte survey plan to increase CRE capital commitment by 9 percent in the next 18 months (see figure 1a), and a significant portion of this could be directed toward REITs. 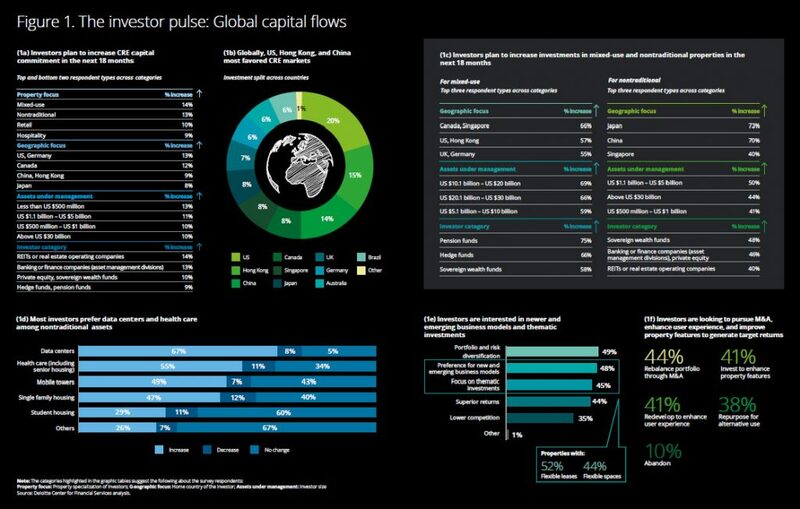 Further, the increased investor interest can particularly help smaller REITs (market capitalization of less than $1 billion) to gain exposure to more institutional investors, as the investors plan to expand beyond core markets in search of yield.13 CREs are also able to use data insights to achieve geographical diversification by targeting investors from different countries. For instance, our survey respondents from Canada (55 percent) are interested more in the Northeast region of the United States, while Chinese respondents (40 percent) focus more on the Sunbelt. Technology has permeated every aspect of the CRE business. Companies are adopting a variety of advanced technologies, albeit at a relatively slow pace compared to some other industries.14 Compared with the rate of technological advancement, the industry continues to play catch-up. In fact, nearly 53 percent of respondents believe that technology advancements will have the greatest impact on legacy properties within the next three years, and 15 percent believe that the impact is already visible. 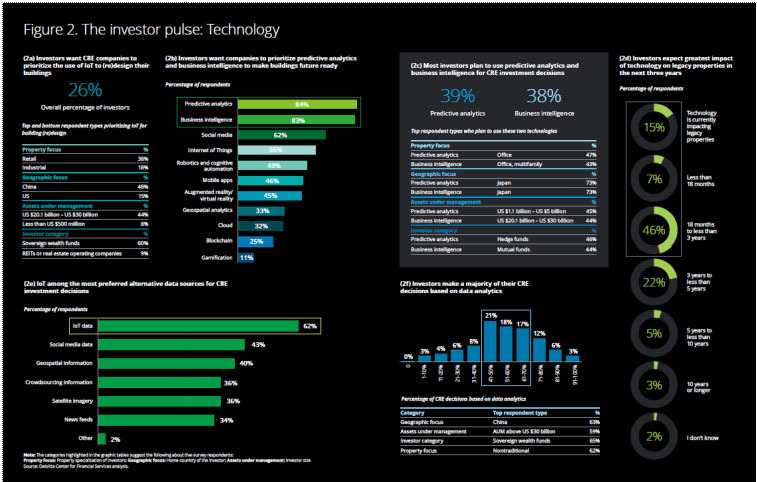 Investors also have certain expectations about technology usage from their CRE investee companies. More than 80 percent of our survey sample believe that CRE companies should prioritize the use of predictive analytics and business intelligence. In fact, over the next 18 months, nearly two-fifths plan to increase the use of these two technologies to make their investment decisions (see figure 2c). More than a quarter of the respondents believe that CRE companies should prioritize the use of IoT technology in (re)designing buildings. Respondents from China (48 percent) and Singapore (43 percent) place a greater emphasis on the use of IoT technology compared to respondents from the United States (15 percent). Perhaps one of the challenges facing CRE companies is the ability to prioritize investments between different technologies and needs. Currently, most companies are tactically focusing on individual technologies relevant for a specific business area and not looking at an enterprise-wide picture. As a result, CRE technology leadership tends to spend significant time and resources in managing both modern and legacy infrastructure while not yet re-imagining the power of fully utilizing data. More than 80 percent of our survey sample believe that CRE companies should prioritize the use of predictive analytics and business intelligence. In fact, over the next 18 months, nearly twofifths plan to increase the use of these two technologies to make their investment decisions. What should CRE companies do to be more agile with technology? While CRE companies have been slow to embrace technological innovations, investors’ expectations indicate it is time to take a more proactive stance. Developing an enterprise-wide strategy and a strong, agile digital core can become increasingly more important to a CRE company’s central strategy, which can be bolstered by implementing data gathering and analytical technologies. 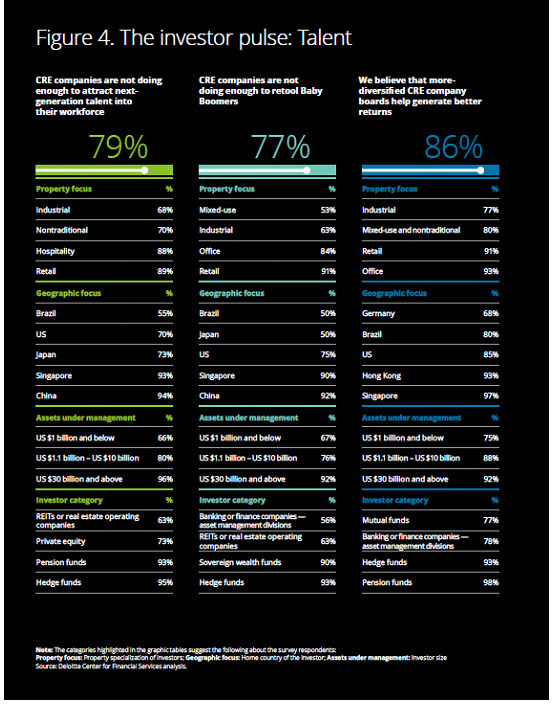 According to Deloitte’s 2018 Global CIO Survey, only one-fourth of organizations globally, across industries, have an enterprise-wide digital vision and strategy.15 To this end, CRE owners and operators may want to consider developing some pertinent questions to evaluate the use of diverse technologies across key processes and functions. An enterprise-wide technology strategy is often a first step toward effective technology deployment and integration, as well as more efficient utilization of IT budgets and resources. For example, the strategy could include an enterprise-wide evaluation of data capture, the use of predictive analytics, and enhanced reporting to management using business intelligence software. A planned and phased deployment of technology will likely yield better results than ad hoc adoption. CRE companies should invest in modern core technology systems that are more dynamic, automated, and easy to integrate with emerging solutions.16 For instance, one of the modern core applications could include smart building management systems carrying out automated procedures and tracking building operations. 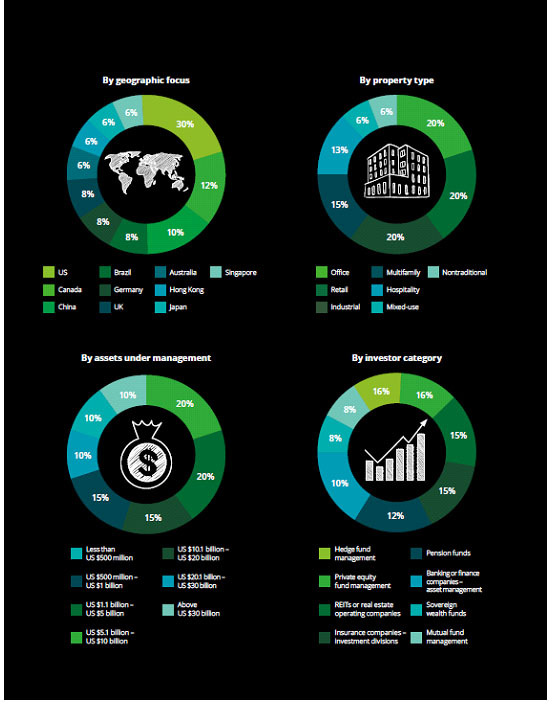 This information can be seamlessly collated for a global property portfolio and leveraged by different stakeholders, including CRE functions and investors, to draw valuable insights. This does not mean that every digital initiative must be run and managed internally. CRE companies can hire external cloud-based service providers for specific business areas or even outsource functions as they phase out legacy enterprise resource planning (ERP) systems. CRE companies should consider different approaches to gather, store, and analyze large sets of internal and external data. Today, not only are many companies overwhelmed by various types of data, but also by the sources. For instance, some of the external and alternative data sources include news feeds, satellite imagery, geospatial information, and crowd sourcing. Internally, advanced technologies such as IoT, blockchain, and robotic process automation (RPA) can result in new data sets. In fact, more than three-fifths (62 percent) of the surveyed investors prefer having access to IoT data for their CRE investment decisions (see figure 2e). CRE companies can gain sophisticated practical insights for different strategic and tactical actions by using alternative data sources and advanced technologies. As an example, companies can create what-if scenarios while managing tenant experience. Some of these could include analyzing tenant benefits due to flexible leases or tenant convenience through better designed spaces. Companies can also collaborate with tenants and drive value by leveraging the insights, whether customer and traffic information for a retail center or employee usage information for an office property. For instance, at its data centers, Google uses AI-based DeepMind and a multitude of information collected by the sensors to forecast pressure and temperature, which has helped the company optimize power consumption and reduce cooling costs by 40 percent. CRE companies can gain tremendous competitive advantage with their ability to harness the various data sets to make fast and informed decisions.